Undoubtedly, Railway is the cheapest, most used and preferred method of transportation in INDIA. Daily, the countless people uses railways to move here and there. Starting from rich to the poor, men to the women, child to the old, student to the professional, railway is the preferred mean of transport for each and every category of the population. If we talk about the long distance journeys, railway is the only option available for the common man, as it’s cheaper than the airways. Travelling somewhere using the railway, just add another flavour to the journey, especially the involvement between the co passengers. We had seen many marriage arrangements fixed by the passengers, travelling in the railway itself. Beside all the wonderful things, only the Indian Railway Time Table is the worrying factor for the travellers, explained in the next section 🙂 . Although, every train has its fixed time table for the running, in actual it’s very rare in INDIA that the trains comes on the correct time 🙂 . To tell you the truth, we regularly use railway for the long distance journeys, but we haven’t seen any train coming at it’s scheduled arrival time, at any instance. People in INDIA, normally adds the 15 minutes delay time themselves, to the schedule arrival time of the train due to the routine delay in the railways. You can check the Indian Railway Time Table at any nearest railways station OR at the official Indian Railways website any time. Do add 15 minutes delay time by default as of routine happening 🙂 . In this modern world, where the majority of the population is owing the Smart Mobile Phone, nobody bother to check the train’s time table or current running status by going to any nearest railway station, everybody prefers to check it online. Most of the times, it works fine and is convenient too. Just imagine if you have been stucked in any area with no internet connectivity, specially the Indian Villages or the places in the outer part of the cities. In this case, the only option left for you is to check it from the nearest railway station. Do you think this will work? 🙂 Don’t you know the commitment of the Railways Employees appointed at the enquiry counters. In most of the cases, your call will never get attended, as they are not active on their chair at the enquiry counter physically. Don’t worry at all, Today we are here with a perfect solution for the person, engaged under such circumstances. Actually, here we are suggesting a mobile app named RailTime, it’s available for almost every mobile platform. It’s the hassle free option to check Indian Railway Time Table, without going online. You can download the free RailTime Android app from the Google Play Store anytime. You will be surprised with the RailTime app size, its apk file (Android Setup File) is just of 305 KB (Kilo Byte) and even it occupy only the 1.6 MB of the storage space after installation. 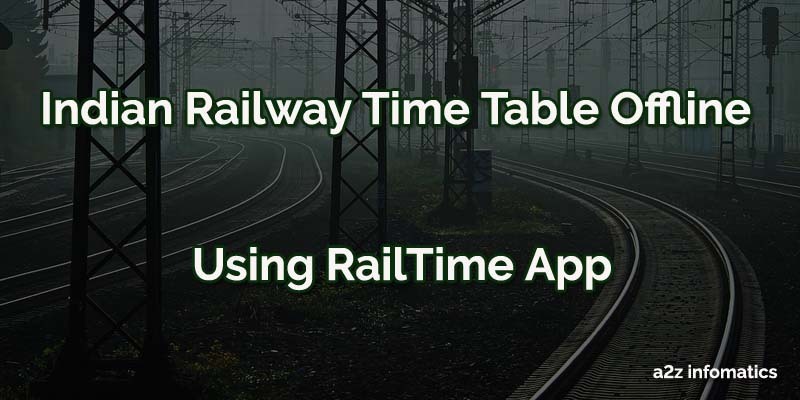 As this application provides the facility to OFFLINE check the Indian Railway Time Table, after installation you have to download the database for the same. The RailTime app will not work offline, if you haven’t downloaded the required database. In addition to this, database has to be regularly updated to remain refreshed with the latest Indian Railway Time Table. Normally, the database updates get released once in a month. Although, everybody is aware of installing the apps in the Android Phone, below are the steps, for anybody who still find it difficult. 1)- Open Google Play Store app in the mobile and perform a search with “RailTime” as a search string. 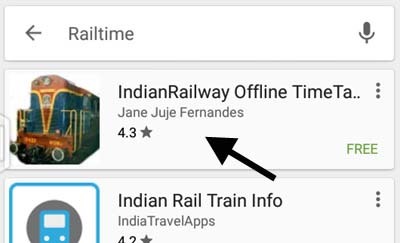 2)- Now, in the search results, Look for the app named as “IndianRailway Offline TimeTabl” by Jane Juje Fernandes. 3)- Tap to it, and Hit INSTALL. Important: RailTime Mobile app is available for most of the other Mobile platforms too, check it out at the respective app store. Congo!, You have successfully installed the RailTime Android app in the Mobile Phone, Enjoy browsing the Indian Railway Time Table Offline. As discussed earlier, the database is the life of the RailTime app. Installation of the database is easiest of the task. Below are the complete steps to install the database. Installing Database into the RailTime Android app. 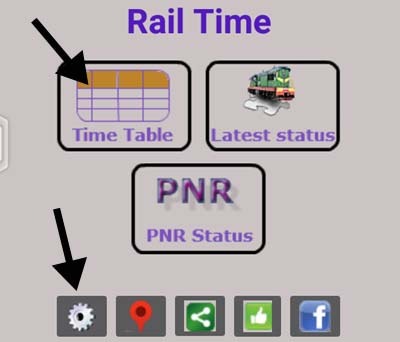 1)- Open RailTime app in the Android Mobile. 2)- If this is the first use of RailTime app, just TAP to the Time Table option and it will ask for the confirmation to install the database automatically. In addition to this, you can download the latest database by getting inside the settings (setting wheel) and Tapping to the DNLD button there. Congo!, Database has been successfully installed into the RailTime app. Important: You have to update the database regularly to stay refreshed with the latest Indian Railway Time Table. Now the main part, checking the Trains time table using the source / destination stations or the train number. Mainly this RailTime app is for offline use only. 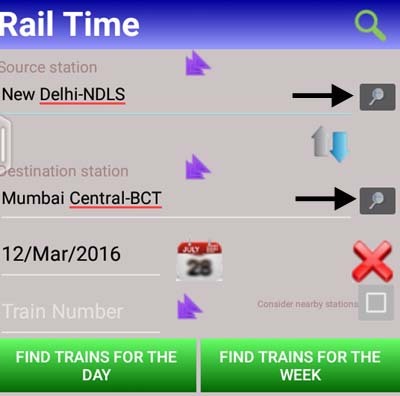 How to Check Indian Railway Time Table Offline using the RailTime Mobile app. 1)- Open RailTime app in the Mobile Phone. 2)- Tap to the “Time Table” section and get inside. 3)- Here, you will be asked to put the Source Station of the train, Just put the station code if you know otherwise just the city name and hit the search button next to it. Now you will be with the list of the stations related to the station code or city, select the desired one. 4)- Now, in the destination station, supply the station code or city name and hit the search button next to it. Same like the above step, select the desired destination station. 5)- In the date section, leave it to default or select any specific date, according to the needs. 6)- In the Train Number section, Leave it blank if you wants to search using the source / destination station. This option is to check the Time Table of any particular train at all the allotted stations. 7)- That’s it, Hit the “Find Trains for the Day” or “Find Trains for the Week” button. Actually, “Find Trains for the Day” button will show you the train on that particular days only whereas “Find Trains for the Week” button will show you each and every train for the desired source / destination stations. 8)- After hitting the Find Train button, you will land to the train information page, here you will get the Arr (arrival time at the source station), Reach (arrival time at the destination station) and the days on which the train is available for you. Important: If you wants to check the time table for any particular train using the train number, do leave the source / destination section blank otherwise it will only show the results, if the given train passes through the source / destination stations. Congo!, Enjoy checking the latest Indian Railway Time Table without having connected to the internet. We hope this app will prove to be an important tool kit for the travelling needs. 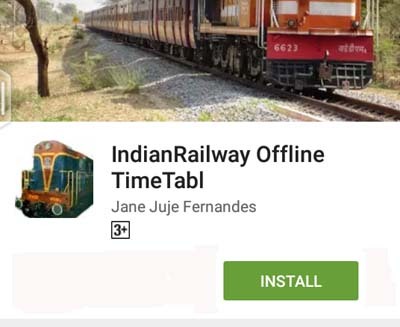 Is the RailTime an official app of the Indian Railways ? Ans- No, this is not. NTES is the official mobile app of the Indian railways. Can I trust the time table data given by the RailTime app?. Ans- Off Course yes, actually the accuracy of the data will depend on how frequently you update the database of this application. Remember this app looks and provide all the information from the database stored in your Mobile Phone itself. 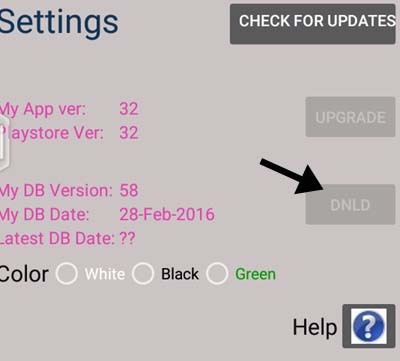 How to update the database of the RailTime app, is there any auto update option?. Ans- It’s very simple to update the database attached to this app, just hit the setting wheel on the app’s main window. There, you will find a button with the “DNLD” text. Hit the button and the database will get updated. As it looks, auto updating the database option isn’t available in the app, at this moment. What are the “Latest Status” and “PNR Status” options in the RailTime app? 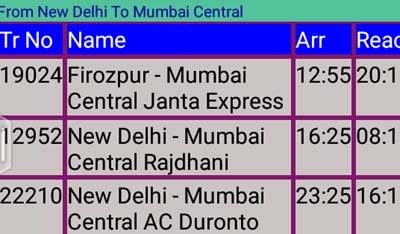 Ans- These options are to check the current status of the train and PNR status of the train ticket, actually they take the user to an external application, if installed in the mobile phone. Today, we have added a new tool into the toolkit of your travelling needs. We hope you will get benefited with this and will share the same among all your friends and relatives. Although, we haven’t missed a single thing about the RailTime app, you can still ask any of the question under the comments section below. That’s all we have for now, Enjoy browsing the Up to date Indian Railway Time Table without any internet connection. Happy Journey in advance, God Bless Everybody.